Birthdays are the BEST! We.Love.Birthdays!! We have hosted hundreds since we opened on the 23rd July last year! All of them full of fun, fresh air and not forgetting mud! But this 23rd July it’s our turn! We will be a whole one year old! What a year we have had! Never in our wildest dreams did we expect the reaction and support we have been lucky enough to receive! Thank you! Thank you to everyone who has visited us, liked our Facebook page, suggested improvements, shared their day with us, or recommended us to anyone and everyone! We have had massive highs and the odd low, but one thing is for sure…we have LOVED it! And as long as you’ll have us…we are here to stay! Getting and BIGGER and BETTER everyday!! 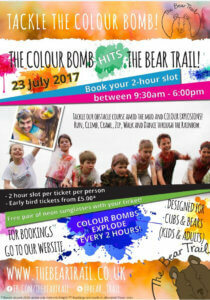 Trail will transform into the ultimate colour explosion! Four colour stations will shower you in the rainbow whilst you make your way around the course! And the best thing?? You can go round as many times as you like in the 2 hour colour bomb explosion! It’s a day out for all the family…from the little ones right up to the big ones!! Grab your ticket early to take advantage of the Early Bird prices!! Once they’re gone, they’re gone!! Remember He Who Bear Wins! Book now to get 10% OFF tomorrow and Bank Holiday Monday! Grab one of our AWESOME TShirts when you visit too!! With this ☀️ we can’t think of a better way to spend day than laughing your way around our SUPER muddy obstacle course! You can still book online to grab 10% OFF entry this weekend 👇🏼 plus all the info about the trail! 🎉NEW FOR 2019 - Book a party of 12 or more kids, the birthday child goes free AND gets a free return visit!! Need something a bit different? No problem! Get in touch today and we can create a bespoke day for you! The Bear Trail updated their cover photo. Make sure you’re one step ahead and sign up for the latest news and offers from The Bear Trail. We know how annoying spam email can be, so we promise to only send you genuine offers.